Some department stores had a challenging 2018 holiday season based on reports of negative or low-single-digit growth in same-store sales. With eroding consumer confidence, 2019 could shape up to be another difficult year for certain retailers. 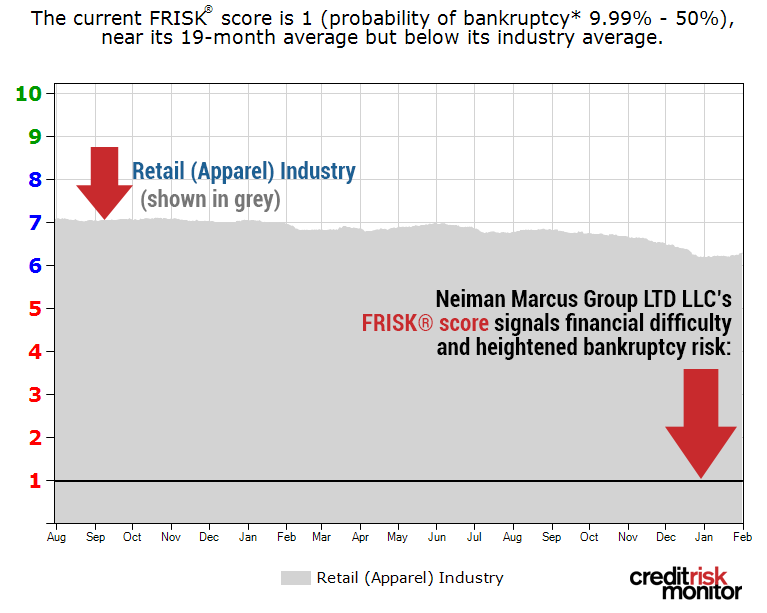 CreditRiskMonitor's FRISK® score has pegged Neiman Marcus as financially distressed, with an elevated chance of bankruptcy. Commercial credit report coverage spanning more than 58,000 global public companies and many private companies. The FRISK® score, which is 96%-accurate* in predicting public company financial stress and bankruptcy risk. The FRISK® Stress Index, a free-to-use tool which measures the probability of failure across a group of companies in any industry, country or customized portfolio. In December 2017, CreditRiskMonitor published its High Risk Report on Neiman Marcus, outlining its severe financial distress. Heading into last year, Neiman Marcus held the worst-possible FRISK® score of “1.” The FRISK® score scale ranges from "1" (highest risk) to "10" (lowest risk) and highlights the riskiest companies in your portfolio. Low FRISK® score companies – anything below a “5” is considered having heightened financial risk – should be given extra attention. Within that report, we examined a few keys areas of Neiman Marcus’ financial condition. Its weak operating performance, which included the company's recurring net losses, a weak interest coverage ratio and an annualized free cash flow deficit, were all major red flags. Pertaining to the balance sheet, Neiman Marcus’s tangible net worth trended in the ballpark of negative $4 billion: an indication that the business had exhausted all of its loanable collateral. When tipped off by the FRISK® score, we also were able to determine that its cash and quick ratios fell well below acceptable levels, and actually ranked in the bottom quartile of its department store industry peers. What has transpired since then? Neiman Marcus' FRISK® score has remained a "1," which should keep suppliers on high alert. A FRISK® score of “1” indicates a probability of bankruptcy spanning 10-to-50% in the coming 12-month period. The Neiman Marcus Group LTD LLC FRISK® score has flatlined in the last two years. As the graph above shows, the company's FRISK® score of “1” also stands well below today’s industry average hovering between a FRISK® score “7” and “6,” as denoted in grey. Neiman Marcus plans to open a large store at Hudson Yards in New York City by March 2019. However, a single store is unlikely to move the needle for this struggling retailer. The company has been unable to demonstrate meaningful improvement in operating performance since we published our High Risk Report 13 months ago. Meanwhile, net interest expenses have crept higher. For quarter period end Oct. 27, 2018, net interest expense increased from $76 million to $81 million on a year-over-year basis, as disclosed in the footnotes. This specific increase by itself may not appear significant, but the overall interest burden has become a problem. On a trailing 12-month basis, operating income was $111 million when excluding one-time items. Backing out amortization of intangibles and lease commitments, as well as depreciation expenses, results in $418 million in EBITDA. Reduce EBITDA by trailing 12-month capital expenditures of approximately $187 million and you arrive at $231 million in adjusted EBITDA. Net interest expenses were $278 million, leaving the retailer's interest coverage ratio at a troubling 0.8 times. Late in 2018, Neiman Marcus disclosed that it was unable to reach an agreement on its previous debt proposals. Such a state of affairs is not surprising, as the company would have trouble refinancing its debt given the numbers outlined above. The company’s Oct. 27, 2018 period end MD&A disclosed that current cash flow, cash balances and sources of financing should allow it to meet its cash obligations over the next 12 months. However, its liquidity will likely be slowly eroded by its existing cash flow deficit. And if the company draws down further on its revolving credit facility to raise cash, its interest burden will continue to increase. Going further on the balance sheet, shareholders’ equity has pushed to a new low of $449 million, and its tangible net worth is still trending around negative $4 billion. Its debt-to-assets ratio is up to 65%, a level that is nearly triple the industry median. To complicate matters, the Wall Street Journal recently reported that a bondholder was suing Neiman Marcus over an asset transfer involving the MyTheresa e-commerce business. According to the bondholder, the move was made to protect this division from creditors and should be nullified based on existing bond covenants. For context, MyTheresa grew fiscal 2018 comparable sales by 37% year-over-year and has received good support from suppliers – clearly a healthy spot in an otherwise stagnating company. Arguments from the bondholder and Neiman Marcus were laid out in the courtroom. Regardless of the outcome of that lawsuit, Neiman Marcus is highly distressed and faces an elevated chance of bankruptcy – the FRISK® score has homed in on their risk quotient and has not been shaken. The most concerning situation is that the retailer's senior secured term loan is set to mature on October 2020, or within reach of the next six fiscal quarters. Time is limited, and the company is running short of options. Their legal tussles don't help the situation. Neiman Marcus’ next quarterly report will likely be a significant mover in the eyes of creditors. If the company reports weak operating income or shows a material deterioration in financed inventory, it will have taken another step down its distressing path. The Bon-Ton Stores, Inc. and Sears Holdings Corporation filed for bankruptcy in 2018 and Neiman Marcus could very well be put to the test next. Based on Neiman Marcus Group LTD LLC’s bottom-rung FRISK® score of “1,” trade creditors must perform deep financial analysis and take extra care when dealing with the company. Its liquidity profile is deteriorating, and it could experience difficulty paying the interest on its enormous debt load. Moreover, it faces a massive maturity wall which will be difficult to refinance. Bondholders are highly concerned about the capital structure and it’s possible that the business could very well end in the bankruptcy restructuring process.